A Rwandan court has dismissed all charges against opposition figure Diane Rwigara. This shows an independence of the judiciary, says political scientist Phil Clark. In a surprise move, a Rwandan court dismissed all charges against Diane Rwigara and her 59-year-old mother Adeline. They had faced charges of fraud and incitement to insurrection over criticism of the government. 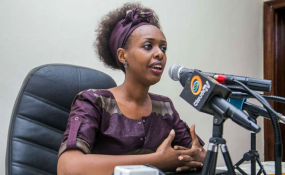 In 2017, Rwigara attempted to run for the presidency against President Kagame but was barred from doing so on the grounds of allegedly having forged supporter signatures. The two spent a year in jail before being released on bail in October 2018. Rights groups Human Rights Watch had previously criticized the Rwandan government, saying that the crackdown showed its unwillingness "to tolerate criticism or accept a role for opposition parties." US lawmakers also weighed in on the international debate surrounding the case, voicing their support for Rwigara. Phil Clark, a political scientist at SOAS in London, spoke to DW about the case. DW: What do you make of the court's decision to acquit Diane Rwigara and her mother? Phil Clark: The significance of the Rwigara decision is that this shows that the Rwandan judicial system is much more independent than many of Rwanda's critics have been suggesting over the last few weeks. International human rights groups and much of the western media for months now have been predicting that this case was a fait accompli and that Diane and Adeline Rwigara would be found guilty on all of these charges. In fact the complete opposite has happened. They've been acquitted of all of these charges and this shows that in fact the Rwandan judiciary very much has a life of its own. It's not simply controlled by President Kagame's executive. What does this verdict mean for other African countries? What we're seeing, in fact, is that the Rwandan courts are representing something that is taking place across Africa. It's often assumed that African courts simply take orders from their executives. And of course that is the case in some African countries. But this is a time of real growth and reform in the African court system. We're seeing in places like Uganda and Congo, and more recently in Kenya, the judiciary standing up to executives and handing down very important decisions that displease governments. This shows, I think, that the African judiciary is going through a phase of increased independence. So maybe we need a bit of a rethink about these courts and how effective they are in fact. Does this verdict mean that there is a change in tactics by President Paul Kagame? What the Rwigara case shows is that powerful actors may still try to use the legal system to their own ends. So it undoubtedly suited Kagame and the Rwanda Patriotic Front (RPF) to have Diane Rwigara put in jail and removed from the election terrain. But if the assumption of the executive was that they would be able to keep Diane Rwigara and her mother in jail for decades, the courts have sent a very strong message that that's simply not going to happen because the evidence against the Rwigaras was in fact very weak. Phil Clark is a political scientist at SOAS, University of London.